At the recent release of Chaitanya Sambrani’s edited volume, At Home in the World: The Art and Life of Gulammohammed Sheikh in New Delhi (Kiran Nadar Museum of Art, February 17, 2019), I was reminded of many of Sheikh’s artworks that I have seen, admired and studied over the years. A high-quality, limited-edition, signed print of one of them, titled ‘Ark’ (2008), hangs in my living room in New Delhi, a familiar presence and permanent talisman to remind me of an idea I find particularly compelling: that India’s moral sensibility can be understood as a dialogue between Kabir and Gandhi, signifying respectively, tradition and modernity, two powerful embodiments of radicalism and dissent in medieval and modern times. It is also a conversation between the Muslim and the Hindu, immersed in a process of exchange and translation over centuries of their irreducible difference, a balancing act, a necessary engagement that is frontal but occurring over a short distance. In the gap between the two figures lies the haven, the sheltering ark, that is our composite culture, ganga-jamuni tehzeeb. But for the continuation of this dynamic of mutuality, the idea of India would perish. Sheikh has spent his entire life as an artist meditating on the moral, aesthetic and political significance of what we refer to, in a rough-and-ready, often unthinking and sometimes dismissive way, as ‘Indian Secularism’. Ahead we reproduce an extract from the conclusion of my first book, Righteous Republic: The Political Foundations of Modern India (2012), that dwells on the meaning of Sheikh’s ‘Ark’ at some length. I wrote Righteous Republic between 2007 and 2011, five years marked by Barack Obama’s presidency in the United States and a Congress-led UPA coalition government in India, the two countries where I lived, taught and did my research. In those years, it was in no way possible to anticipate either Donald Trump or Narendra Modi as the future leaders of the two democracies. Although the world struggled with a major financial crisis, the global turn to authoritarian populism, right-wing strongmen, and majoritarian rule was yet to occur in the way that it subsequently did. My own understanding of the making of modern India emerged from my study, for the book, of colonial-era nationalism, which I saw as a search not just for sovereignty, but also for selfhood, the swa- in swaraj, in the political and moral thought of the founders of the Indian republic. The figures of Gandhi and Tagore, anti-colonial anti-nationalists, confronted in a sense, Nehru and Ambedkar, modernists and advocates of the nation-state and its sovereign power. Whatever their disagreements, the political idealism, complex historicism and sheer moral force of these men coloured my view of India, even into the flawed and failing present. In the Modi years, the ‘righteousness’ of the republic took a serious battering. My project had always been about uncovering a structure of ideas, the wheels and gears of norms and values fashioned in the late colonial period, on which the political juggernaut of Indian democracy could move forward over the decades after Independence. But in the past six or seven years, after my book came out, it has seemed that this entire scaffolding of egalitarianism, democratic principles, constitutionalism and indeed secularism, has come under sustained attack from the popularly elected regime of the Hindu Right. As I have written elsewhere, ‘Hindu Rashtra’ has all but supplanted ‘Hind Swaraj’. Many have attacked my argument, especially my book’s title, as though the fall from any sense of an ethically responsible, non-violent and truth-centric polity, in a Gandhian vein, were my fault for having chronicled the building of a road not taken. True, I had tried to search for the genealogy of the philosophical categories that made the Indian experiment so unique in the annals of modern politics. I had evaluated both the intellectual and the moral efforts of the founding fathers, assuming that they were made in good faith. But today it is clear that the unfinished business of Partition, the unaddressed scandals of Gandhi’s assassination and Ambedkar’s conversion, the breaking of the Babri Masjid and the carnage in Godhra, all of these open wounds of our post-colonial history have run over into rivers of blood, like some terrifying installation by the contemporary artist Nalini Malani. Or indeed, like several works by Gulammohammed Sheikh himself, set in Ayodhya or Gujarat, in which the fires of communal hatred and sectarian violence are seen to consume the delicate, many-hued fabric of India’s public life. Like so many in the broad spectrum of the Indian secular left, I too have spent the years between 2014 and 2019 in a state of protest and refusal, often literal, on the street, in demonstrations, in signature campaigns, in writing and in art, in speech and in silence. I have been witness to the decimation of liberal institutions and the gagging of dissenting voices. I have been forced out of the shelter of the library and the archive into the open grounds of political struggle and critical pedagogy, as a virulent Hindutva threatens to completely overwhelm everything I hold dear about my country and the political culture I grew up with. I have met Gulam and Nilima Sheikh countless times in recent years not at art exhibitions but at protest marches and meetings of concerned citizens to save our collapsing universities, get our embattled journalists, students, writers and activists out of jail, denounce the appalling lynchings and rapes of minorities, and try to find ways to keep our democracy afloat in the face of a flood, a world-wide deluge, of aggressive right-wing populism and toxic nationalism. The ark whose image hangs on my wall is foundering. On the eve of the 2019 general election, its preservation is all I care about. On the other end of the boat sits Kabir, quoted from a work by Mangal Chatterra, made at almost exactly the same time as Nainsukh’s painting, about 1760, either in Amber or elsewhere in Mughal India.6 Stretching between Gandhi and Kabir inside the ark is what appears to be a water body, a bluish expanse, in which float tiny figures of sages, saints, skeptics, and Sufis, each one again a quotation, in Persian, Italianate, and Indic styles. This array of figures includes St. Francis of Assisi, Abdur Rahim Khan-i-Khana (Rahiman), and the twentieth-century artist and Sheikh’s friend and colleague Bhupen Khakhar (1934–2003), as well as other known and unknown characters from history. Sheikh calls this a sangat, literally, an assembly of the virtuous.7 The blue in which they are studded like small jewels is in fact a lake in the city of Baroda, Gujarat, where Sheikh lives and works (as did Khakhar). The palace of Jasrota, as well as the mountain shown in Nainsukh’s painting, also make it onto Sheikh’s ark. The ark in Sheikh’s painting floats in a turbulent expanse of dark, swirling waters, on the far extremity of which, poised like an island, is Surendranagar, where Sheikh grew up. The work has a visual richness that comes not only from the splicing of multiple other works into the body of the image, but also from the mixture of painting and photography on the one hand, and reproduction and interpretation on the other. I saw this painting on display in New Delhi, in October 2011. As I stood before it, looking at Gandhi and Kabir on either end of a huge ark, sheltering between their gigantic fi gures numerous small and often anonymous figures representing spiritual and skeptical, creative and analytic aspects of civilization, I understood in a single moment of apprehension—not unlike Coomaraswamy’s samvega—that what Sheikh sought to depict was a composite image of India’s traditions: religious, aesthetic, and learned. Sheikh does not invent his own Gandhi and Kabir ex nihilo; rather, he quotes, Abanindranath’s Gandhi and Chatterra’s Kabir, both of whom are thoroughly historicized in the moments in which they are articulated—respectively, nationalist and Mughal. The modern, political figure of Gandhi is in dialogue with and acts as a counterbalance for the medieval, mystical figure of Kabir. Both are necessary to keep the ark from foundering in the stormy waters of moral uncertainty and historical oblivion that surround the idea of India. India is neither the past nor the future, but a present that emerges out of the conversation between tradition and modernity, the concrete and the transcendental, the political and the poetic, the Hindu and the Muslim, Gandhi and Kabir. In a lovely postmodern gesture, the conversation between the painters Nainsukh and Sheikh, one a precolonial master, the other a postcolonial master, embodies and encapsulates the dialogue of tradition and modernity even as it takes that very dialogue as its subject. The recently deceased Bhupen Khakhar, set apart from the cluster of non-modern ascetics—Hindus, Muslims, and Christians—at the center of the boat, absorbed in his canvas at a distance from the others, perhaps stands in for Sheikh too, invoking the contemporary artist who at once is thoroughly individualistic, suffers from a very modernist alienation, and thinks deeply about the rich and sometimes mysterious past with which he may or may not be connected. I take Gulammohammed Sheikh’s Ark to be an almost perfect symbol of the argument I have tried to make in this book. Over the years that it took to write, political debates in India have naturally traversed a varied territory, from the rise and recession of the Hindu Right, to the electoral rout of the Communist Left, to the intensifying violence between the Indian state and its Maoist opponents, to the fluctuating fortunes of the Kashmiris, and, most recently, a public outcry over widespread corruption in the highest echelons of the government and the private sector. At different moments, developments and discussions in contemporary politics reminded me of the founders and their concerns, and of the promises of anticolonial nationalism that often seem to have been badly broken in our own time. But I also began to see, as political life in India today changed and shifted, that many of my questions go to values and norms that are in a sense stable and abiding underneath the flux of news and current affairs. One wants to know how Hindutva as an ideology of majoritarian religious nationalism distorts and instrumentalizes history in order to persecute minorities, or how Anna Hazare, the aged farmer-activist leading a citizens’ campaign against corruption in 2011, alludes to the memory of Mahatma Gandhi through the tactic of the hunger strike. But even if such queries were answered through a careful analysis of the present, one would still seek an account of how it was that by placing ourselves in a complicated yet determinate relationship to tradition, we actually became modern. At the very beginning of my inquiry, I took as my talisman MacIntyre’s insight that a crisis in the self is a crisis in the tradition that has formed the self. India’s sense of self seems once again under stress, as the country enters its third decade of globalization and neoliberal economic policy, and they bring in their wake stronger manifestations of what Gandhi called ‘Western civilization’ (or kudharo: literally, ‘the evil stream’), such as aggressive urbanization, rampant consumerism, and late capitalist hypermodernity. We may or may not be able to look objectively at the current crisis in sovereign selfhood, but by reflecting on the crisis that India went through less than a century ago—a crisis whose resolution provided the warrant for the new nation-state—we may discover what kinds of soul searching, acts of reading, and interpretive leaps are necessary at such junctures in history. It may be too much to ask for new minds of the order of Tagore, Nehru, and Ambedkar to apply themselves to the construction of India’s future in the twenty-first century and beyond, but because we still have the work done by the founding generations as an example and a precedent before us, there is a plinth upon which we stand, and a vantage from which we may survey what is past, or passing, or to come. On the banks of our river there are raging fires unleashed by economic liberalization. Urban settlements that are more slums than cities remain mired in polluted land, air, and water. Adrift in a time of turbulence, a delicate ark harbors the fragile resources for cultural renewal, civilizational memories that are also our only hope for salvation from the more virulently antihuman manifestations of modernity. Foregrounded in our consciousness are the ideas and words of giants like Kabir and Gandhi, boatmen who forded the confusions of their own times with insights, whether political or poetic, that restored balance and provided direction to societies—to our own society at earlier points in its history—that might otherwise have been plunged into extreme uncertainty and perhaps terminal decline. Traditions that do not renew and reorient themselves, that fail to make the epistemological breakthrough, that do not gather themselves and chart, with the help of the oars of criticism and creativity, a course through the onrush of the future, are doomed to founder and be forgotten. About 250 years ago, Nainsukh saw his patron, Balwant Singh of Jasrota, plunged into a political crisis, howsoever local and personal its dimensions. Everything precious had to be sheltered and carried to safety, at least in the painter’s imagination. Gulammohammed Sheikh, painting in Gujarat not long after the carnage of 2002, makes a similar plea for saving the traditions of self-examination and self-mastery, of peaceful coexistence and affective community, of rational inquiry and ecstatic transcendence, that have characterized India and kept it buoyed for at least a millennium. Sheikh’s ark of tradition is both capaciously accommodating and precariously poised on stormy waters. His Gandhi is speaking to (an invisible) Tagore, the modern poet, but looks across to Kabir, the medieval poet, who weaves his subtle cloth as he always did, into the fabric of meaning. In this wordless, continuing, and resonant dialogue the ark is balanced and kept afloat, and perhaps by paying close attention to our ancestors, we too may be able to get across to safer shores. Kabir, who sits at one end of Gulammohammed Sheikh’s ark, appears to me as a symbol of the self that India seeks—not because he appears in any direct or prominent way in the discourse of the founders (although all five knew of Kabir, obviously), but because Kabir exceeds the binaries in which Indian history remains imprisoned; because Kabir too ought to be read with the same seriousness, the same lack of presumption, the same willingness to encounter something completely unforeseen, and the same daring with which the founders read the texts that they felt called out to them from the welter of past traditions. Today Kabir’s popular reception makes him well-known, but his peculiar language leaves him poorly understood. We are too eager to make him into an icon of our concerns— secularism avant la lettre, early modernity, a poetic canon, linguistic innovation, syncretistic culture, social radicalism, premodern egalitarianism, subaltern consciousness, or any number of other desiderata and agendas that we love to foist on him. But in fact these quick fixes and facile characterizations do not even begin to capture the imaginative worlds, the spiritual power, and the discursive fecundity of the poet Kabir. Even as we fill out the details of Kabir’s life and times, even as we know more and more precisely his biography and historical surround, even as we sing and recite Kabir with alacrity, the full import of his metaphors eludes us. This ignorance on our part is a result of our inattention to what Kabir did, with and to language, in order to address the mutually constitutive crises of self and tradition that he faced in his own context, his own moment. Gulammohammed Sheikh’s intuitions—that Kabir balances the boat, that he steadies the ark, that he fords the waters, that he weaves the fabric, that he converses with the modern even while remaining in and of the medieval—these for me image with an uncanny perfection the role that Kabir must play, and the quest that he represents, as we try to understand the relationship between crisis and self-fashioning at the very moment of India’s emergence into presence within the horizon of capitalist modernity. 1. See John Guy and Jorritt Britschgi, Wonder of the Age: Master Painters of India, 1100– 1900 (New York: Metropolitan Museum of Art, 2011); B. N. Goswamy, Nain-sukh of Guler: A Great Indian Painter from a Small Hill-State (New Delhi: Niyogi Books, 2011 ), 160–166. 2. Goswamy, ’92. A Boat Adrift on a River: Illustration to a Folk Legend,’ in Nainsukh of Guler, 234–235; and Eberhard Fischer, ‘An Evening with the 18th Century Pahari Painter Nainsukh,’ India International Centre, Webcast, 23 November 2011, http://www.iicdelhi .in /webcasts/view_webcast/an -evening -with -the -18th -century-pahari -painter -nainsukh. 3. 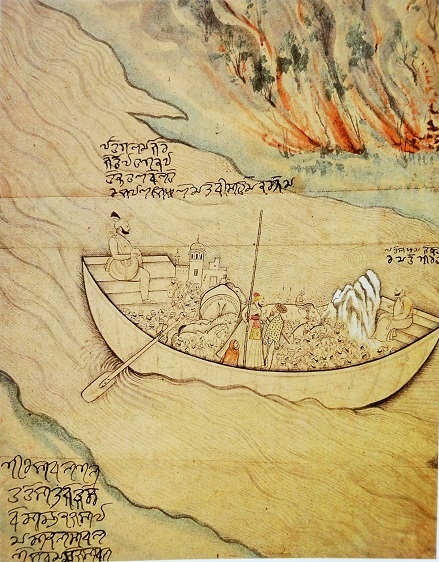 Nainsukh’s Boat Adrift on a River: Illustration to a Folk Legend (tinted brush drawing on paper, c. 1765–1775) is in the collection of Bharat Kala Bhavan, Varanasi. 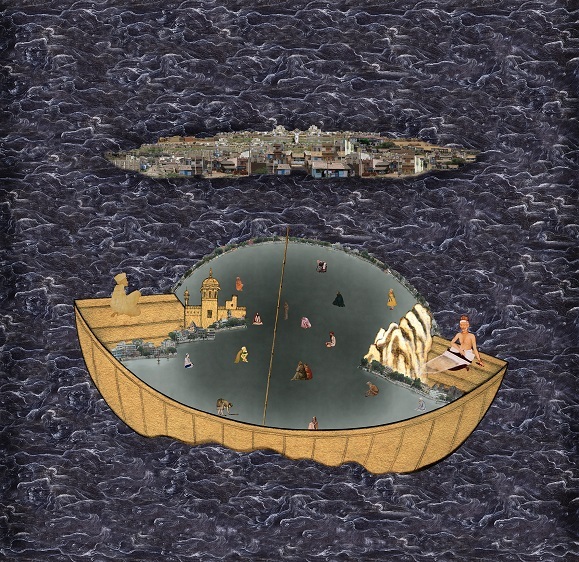 Gulammohammed Sheikh, Kaavad: Travelling Shrine: Home (New Delhi: Vadehra Art Gallery, 2008). In an e-mail, Gulammohammed Sheikh wrote: ‘It is entitled ‘Ark,’ a digital collage print in two parts (8′ ×4′ each) made in 2008 made for the inner wall of shrine entitled ‘Kaavad: Home.’ ‘Kaavad: Home’ is now in the collection Kiran Nadar Museum in Saket, New Delhi. I have made a few smaller prints of ‘Ark’ on a single paper and a version of it (entitled ‘Ark-II’) shows figures in the lake in a spread out form.’ See also, Gulammohammed Sheikh, City, Kaa-vad and Other Works (New Delhi: Vadehra Art Gallery, 2011). 5. See Tagore Gandhi and Andrews, c. 1921, watercolor on paper (Kala Bhavana Collec-tion), in R. Siva Kumar, Paintings of Abanindranath Tagore (Calcutta: Pratikshan, 2008), 212–213. Text © Ananya Vajpeyi; ‘Ark’ © Gulammohammed Sheikh. Ananya Vajpeyi is an Indian academic and writer. She is Fellow and Associate Professor at the Centre for the Study of Developing Societies, New Delhi. Read her full bio here. These are excerpts from her award-winning book Righteous Republic: The Political Foundations of Modern India published by Harvard University Press. Republished here with permission from the author.